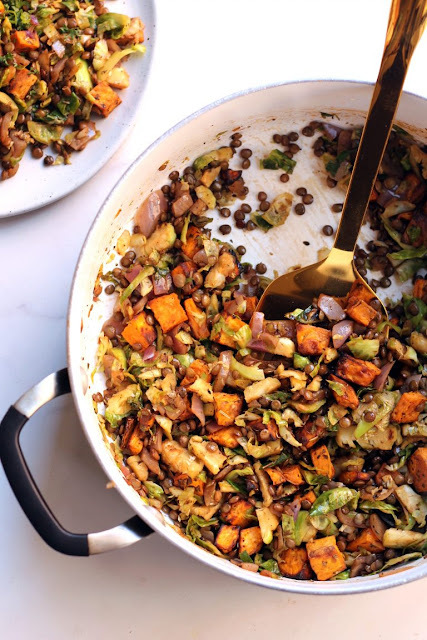 This hearty Loaded Lentil Salad is packed with protein, fiber, and warm veggies like roasted sweet potatoes, red onion, and Brussels sprouts. Perfect for a light lunch! Vegan and gluten-free. First off, when the recipe calls for sautéing in butter, feel free to swap in extra virgin olive oil. The Loaded Lentil Salad is completely vegan, nut-free and gluten-free by simply leaving off the feta. The Red Rice Bowl is vegan, nut-free, and gluten-free as long as you omit the eggs. The One-Pot Tortellini is a classic vegetarian pasta dish that inherently contains cheese and gluten. The boyf gobbled this one up! If you’re game for some major substitutions, you could always use the garlic, kale, veggie stock concentrate, and panko and whip up your own version of cheezy pasta using almond milk, nutrition yeast, cashews, pesto, and pasta of your choice. With this one you’re pretty much adjusting the entire recipe but if that’s in your comfort zone, go for it! Preheat oven to 425F. Line two baking sheets with foil or parchment paper. Heat ½ tbsp olive oil in a medium pot over medium heat. Add onion and cook until softened, about 5 minutes. Add lentils and water. Bring to a boil then reduce heat to low and simmer until tender, about 15-20 minutes. Season with another pinch of salt and drain any excess water. Return to pot. 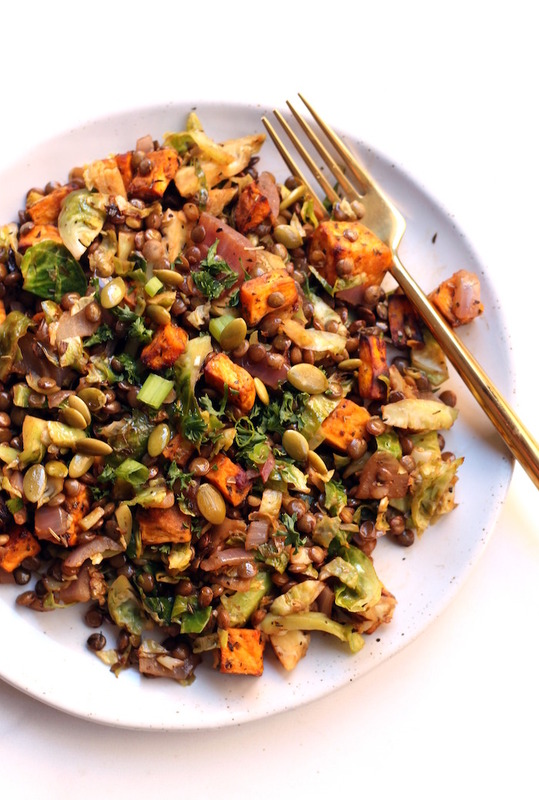 Add balsamic vinegar and remaining 2½ tbsp olive oil to pot with lentils. Add veggies and season to taste with salt and pepper. Top with pepitas and serve! 0 Response to "LOADED LENTIL SALAD"